Into the night to save the day! 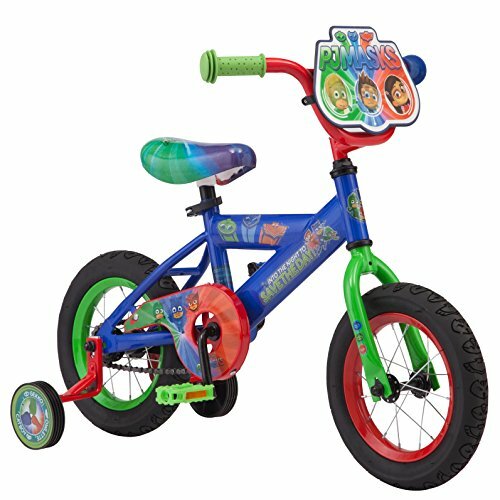 bring the Magical fun of your child's favorite show straight to the driveway with the 12" boy's jpg masks multi-character Sidewalk bike! this fun ride combines the adventure of jpg masks with the excitement of learning how to ride a bike, and crucially still provides important safety features. It starts with the durable steel jpg masks frame, the perfect beginner's ride that brings everyone's favorite pajama-wearing heroes along for the ride! little fans of the show will love the multicolored frame which features the group's tagline and sweet jpg masks graphics. Removable training wheels help make learning to ride a bike easy and fun, while the single-speed drivetrain and coaster brake (also known as a pedal brake) help keep things simple. And the tool-free adjustable seat post ensures your child can grow with the bike! while you rest easy knowing the safety features are covered, your little hero will delight in the fun handlebar plate, flashy laser-printed seat and a chain Guard featuring the entire jpg masks Squad. Don't let ROMEO and Luna girl get away with their EVIL deeds! save the day with the 12" jpg masks Sidewalk bike.